When it comes angels, most of us typically fall into two camps: We’re either total non-believers, or we associate them with religion. But there’s a shift happening in the world’s spiritual underground, and it’s all about reaching new heights in healing and happiness by cracking open old beliefs about reality—and the range of Angel Therapy is a non-denominational spiritual healing method that involves working with your guardian angels and archangels (kind of like the managers of the angel world). Everyone has guardian angels and connecting with them helps create more peace in your life. Believers, well, believe that angels can give clear guidance in many areas—finances, relationships, health, and tapping into your life’s purpose. They’re practical helpers who intervene in our everyday lives, but you’ve gotta ask for their help, because angels don’t, and won’t, impose on anyone’s freewill. How polite! Hanuman is also an Indian angel but until you don’t call upon him he won’t come to disturb you right? 3. What will it feel like? Practitioners say connecting with your angels feels like meeting family or reuniting with best friends you haven’t seen in ages—there’s a sense of familiarity, love, and recognition that’s healing, all on its own. 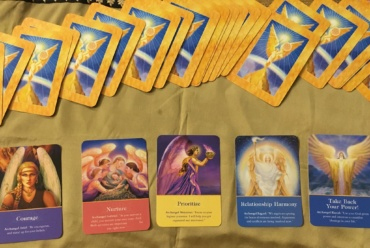 Come prepared with questions or intentions, and you (or your practitioner) will be guided to the angel cards that are most appropriate for you at the moment—kind of like tarot. Expect a co-creative experience in which you, the practitioner, and the angels all come together. 4. Who are the pros? 5. Is it for me? Spiritual Souls who are ready to go deeper and believe in miracles. So, yes!